Having the appropriate fireplace accessories makes use and clean up more efficient and easy! Here is an ash bucket for containing the fireplace leavings that would otherwise cause a mess. 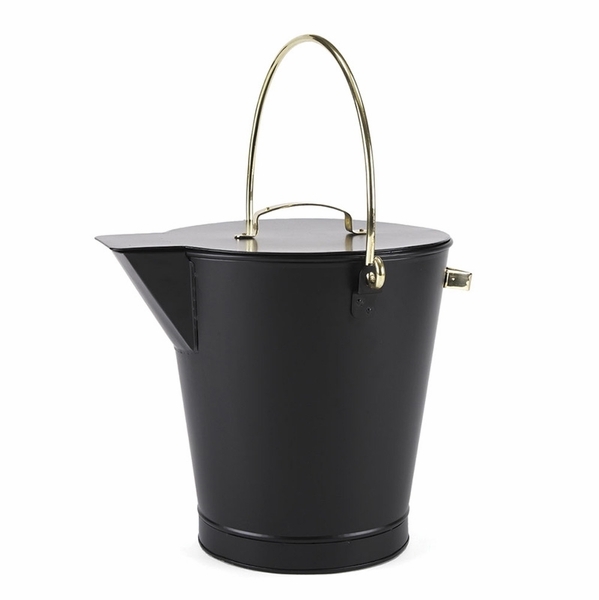 This one is black powder coated with brass handles; however, it also comes in all black if you prefer. Measuring 12 inches in diameter and 13 inches high, its size is appropriate for a clean up job while occupying the lease amount of space for storage. The cover keeps dust and ash from wafting out, and two convenient handles allow you to carry and dump the hot ashes without danger. The double bottom insulates the bucket as well. We actually use this bucket to hold pellets for our pellet stove, and it does that job very well. It is much easier for my wife to lift up a small bucket of pellets than to lift those enormous bags. If other people are looking for a nice pellet container, I would recommend this as working just as well as something that says for pellets on it. Fully loaded it wouldn't weight more than twenty five pounds, so just about anyone could get it off the floor and into a pellet chute. The bucket feels like it will last for a while.